‘This is without doubt an incredibly interesting trial and a positive step forward that has had remarkable results. There has been a huge amount of interest and great awareness of EB since this story broke into the public domain. As someone with EB, I think it should be noted that this was a trial with a Junctional EB patient and the young man had to have extensive operations and monitoring. The results of this trial are an enormous step for those suffering from Junctional EB, but that doesn’t automatically mean it will transfer to other types and subtypes of EB. We need to support the next step in this process to explore if or how this trial can help other types of EB. The fantastic thing is that all these trials are a step in the right direction; one monumental step in finding viable treatments for EB around the world. What does this all mean and what happens next? When is this available for me? There are on-going clinical trials in a variety of research areas. This particular trial was in Germany, similar work is on-going in other countries. Clinical trials aim to make sure that a treatment is safe and works as planned in a suitable number of patients. Once this information can be confirmed, treatments are then made available. Can it be used for other types of EB? While this trial was for Junctional EB, we hope that learning experiences will enable the research teams to replicate across all types of EB. But, this can be a complicated process and needs more research to determine if and how this would translate to other types of EB. Is all research now only going to focus on those with severe cases? Research will continue to cover all types of EB for quality of life treatments and, ultimately, a range of cures. This is not a cure, but is a great move forward for this child and his family, as well as advances the science and knowledge we have about treating EB. What is DEBRA doing to help with this? DEBRA continues to support pioneering research with recent funding provided for projects on itch, wound healing and drug therapies. Is this guaranteed to work for everyone? Unfortunately, there are never any guarantees; however, it is great to see this has worked in this case and hopefully may be replicated for others in the future. Each of these trials creates learning opportunities and moves forward. 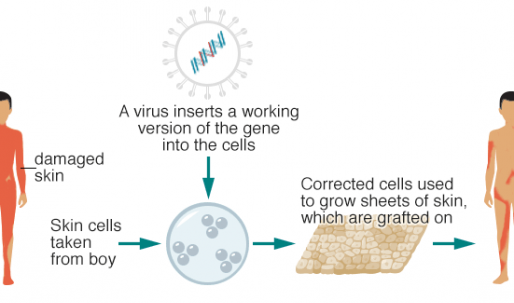 We hope experiences learned from this trial, and other similar work, will enable further studies and research with a focus on skin grafting, cell treatments and the use of gene editing. Can this be done again? We hope so! DEBRA will continue to focus on innovative research and clinical trials to help EB sufferers, replicating successes whenever possible. Cells were taken from this young boy’s skin affected by EB, corrected in a lab environment; new skin was grown and replaced. Clinical trials typically cost in excess of £1 million – this particular trial is estimated to cost several million Euros. If this trial has been successful, why do we need to fund further trials before we can start putting this into practice? Clinical trials test treatments and medicines to make sure they are safe to use and work as planned; trials would normally involve a suitable number of patients. A larger number of patients will need to be treated, and more assessments made, to ensure that this is the case. Why does this trial differ from other skin grafting trials, and why has this one worked? A number of centres around the world are using skin grafting techniques and, of course, this has been carried out in patients with burns for a good number of years. What differs in this case is that the cells that were taken were genetically corrected before the skin was grown and used for patient treatment. Following the results of this trial, are there plans for Germany to make this treatment available? If so, when? This was a collaborative piece of work involving researchers and doctors from across Europe. Clinical trials will need to be continued to ensure that this treatment, and others like it, are safe and work as intended. If I want my child to be involved in a trial what is the application process and timescale? To take part in any type of clinical trial, the first person to speak with is your own doctor. They can talk to you about the trials they may be taking part in and assess if you may be medically suitable.